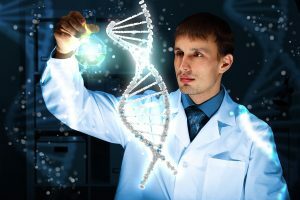 Gene editing: The next frontier of personalized healthcare? The promise of personalized healthcare is that treatments have the potential to be more effective because they’re tailored to each individual’s genetic makeup and personal risk factors. Now, recent advances in gene editing may open the door to new treatments for a range of life-threatening diseases and genetic disorders. For many diseases, including cancer, disease starts when something goes wrong with the gene or genes that control the function of certain cells. For many years, researchers have been able to identify which gene mutations are associated with specific diseases, but there has not been a simple way to repair the defective genes and reverse the disease process. Gene editing allows specialists to use specially designed molecular tools to delete, repair, switch off, or replace defective genes with a healthy copy. The editing can be done to the patient’s own cells or cells from a donor. Most of the work in gene editing so far has taken place in animal studies, but a baby girl in Britain underwent an experimental gene editing treatment when all other treatments for her leukemia had failed. The initial results of her treatment have been positive, with her physicians declaring her cancer-free. Researchers note, however, that more study and long-term follow-up are needed to find out if the treatment will continue to work, whether it will cause serious side effects, and whether it would be a safe and effective option for other patients. Gene editing, which is still in the early stages of development and testing, is just one of the tools used in personalized healthcare. There are already approved genetically-targeted treatments for certain forms of cancer and researchers are working on similar treatments for other diseases, including diabetes, heart disease, multiple sclerosis, and rheumatoid arthritis. There are also genetic tests that can show whether certain types of chemotherapy and other drugs will be effective for an individual’s cancer. The key is to partner with a primary care physician who practices personalized healthcare. In addition to using genetic information to personalize your care, your physician will also develop a tailored strategy to preventing health problems based on your family history and lifestyle factors (weight, stress management, sleep, diet, tobacco use, alcohol consumption, and exercise) to help manage your risk factors and protect your health. A personal health advisor can be another good resource and can connect you with an experienced primary care physician and nutritionists, fitness, sleep, and stress management experts so you can take a proactive role in your care.